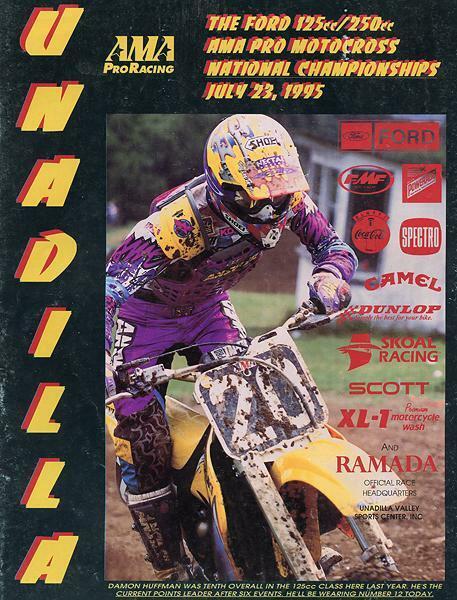 It’s a good thing ESPN started covering the AMA Motocross tour in 1994, because by 1995 a super-deep field of talent was ready to challenge for the 250 AMA National Championship. In fact, the ’95 field is one of the most start-studded ever, and they would get to battle over the course of the full 12 rounds, instead of the split 250/500 seasons that were run up until recently. Jeremy McGrath had his best year to date as a professional in 1995, sweeping both the AMA Supercross and AMA Motocross titles. Defending Champion Mike LaRocco carried the #1 plate, and his teammate Mike Kiedrowski, the '93 champ, was ready to get his title back. Doug Henry and Jeff Emig made the jump from the 125 class with titles in hand, and the upstart of the 1994 season, two-time race winner John Dowd, was now alongside Emig at factory Yamaha. Further filling out the field was 250 World Motocross Champion Greg Albertyn, who had moved to the U.S. as part of a rejuvenated Team Suzuki effort. Suzuki brought in Roger DeCoster as team manager (returning him to the brand in which he won his five 500cc World Championships). Albee, a South African, was the first 250 World Champ to leave Europe for the U.S. since JMB a half-decade earlier, so this move was still met with raised eyebrows, especially since Suzuki hadn’t won the 250 National Championship since Kent Howerton claimed it in 1981. At the Gainesville opener, this talent was on full display. Albee had crashed himself out of AMA Supercross immediately, but he showed up ready for the outdoors and snagged the early lead in his very first motocross race in the U.S. LaRocco was soon there, too, and the two 250 champs from ’94 duked it out, with LaRocco ultimately winning the moto. But disaster struck in moto two for both, as they each broke wheels and DNFed. Inheriting the lead and his first ever 250 National Motocross victory? Jeremy McGrath. 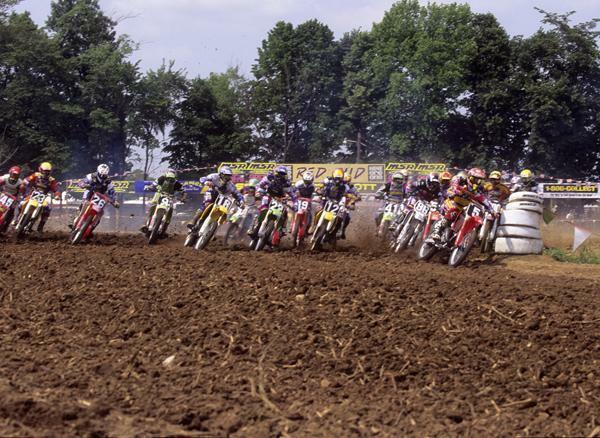 Steve Lamson (#5) won the 125 National MX Championship in 1995 as McGrath's teammate at Honda. Up until that day, Team Honda's McGrath was considered the ultimate supercross specialist. He won the '93 and '94 AMA 250 SX titles while finishing only third in the ’93 125 Nationals and third in the ‘94 250 Nationals. The riders he would routinely topple for the SX crown—like LaRocco, Emig and Kiedrowski—would clean his clock outdoors each season. That was until 1995, when “Showtime” vowed to up his game. He embarked on a rigorous training program with one of the original stars of American Motocross, Gary Semics, took outdoor testing more seriously, and vowed to prove himself as worthy in motocross as supercross. At the same time, LaRocco continued to step up his supercross game, and was still within striking distance of McGrath in indoor points by midseason. But his run came undone while leading the Charlotte SX. LaRocco cased a jump and broke his arm, ending his supercross campaign and also knocking him out of the nationals, which had started at Gatorback on March 5. Hey, that's Larry Ward's Noleen Yamaha behind that nineties' calendar girl. LaRocco’s teammate Kiedrowski picked up the slack by dominating Hangtown, the second round, on May 7. The MX Kied looked unstoppable there, but then couldn’t find that magic at the other rounds. Instead, Doug Henry began to step up during his first year on the 250, winning the third round at High Point and closing up to McGrath in points. It all led to a fateful day at Budds Creek. LaRocco has his arm plated and came back to racing early. He led the first moto while Henry and McGrath battled hard for second. Henry held the spot, which would have given him the points lead by the time the moto was over. Instead, he made a mistake that would lead to one of the most memorable—and gruesome—images in motocross history. Approaching Budds Creek’s biggest downhill jump, Henry was trying to out-brake McGrath, only he was unable to actually get on the brakes! Henry launched off the summit practically wide open. He jumped perhaps higher and further than anyone had ever seen a racer go, and landed with a massive thud. Experts compared the impact to Henry jumping off of a five-story building. His back practically exploded on impact, and at the moment, it appeared the two-time 125 National Champion’s career might be over. We found a clip on YouTube here. 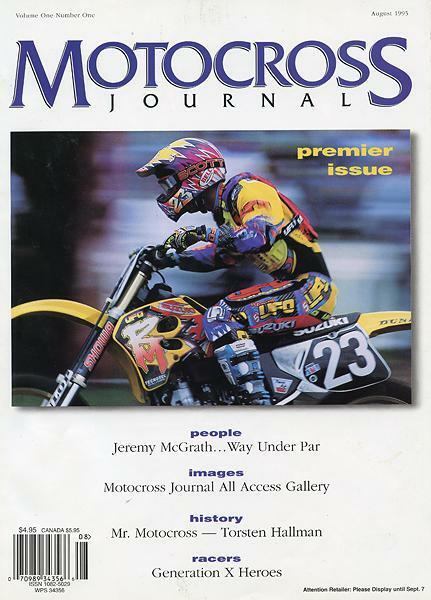 Tim Ferry graces the cover of the second-ever issue of Motocross Journal. McGrath came back to win the second moto over Emig. Kiedrowski couldn’t find his Hangtown pace, LaRocco would later tear his knee up, Henry was out and Albertyn was crashing all over the place. Emig and McGrath were set to take over the nationals, providing the star power the series’ lacked in the vacuum of Johnson, Ward, Stanton and Bradshaw. With these two, you had young, stylish, fun-loving riders who seemed to have a good time wherever they went. The fans picked their favorites and got to watch some great racing. In ’95, McGrath clearly had the upper hand, though, and he romped to the championship, silencing forever those who said he couldn’t ride outdoors. Add McGrath's seven AMA National wins that summer to his 10 wins in AMA Supercross and his was the most dominant in AMA history up to that point. 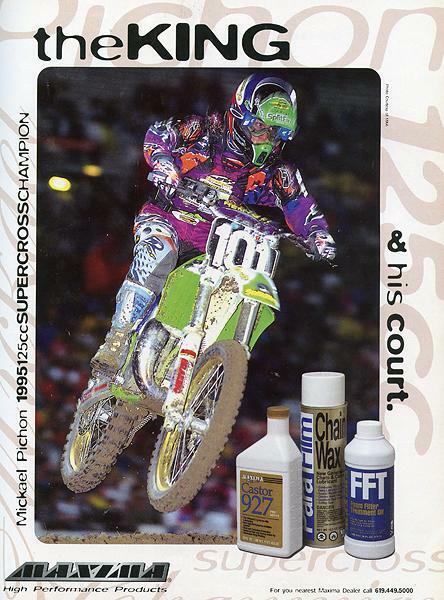 Mickael Pichon arrived on these shores in '95 and won the 125 East SX title but did not win a race outdoors. The 125 class, as always, provided great drama. After finishing second in the series in 1994, Steve Lamson was the favorite going in after Henry moved to the 250 class. But a knee injury knocked him out of the series early, opening the door for Suzuki's Damon Huffman and Splitfire/Pro Circuit Kawasaki's Ryan Hughes. Huffman was smooth and consistent, Hughes ultra-aggressive. And on occasion, Kawasaki's Robbie Reynard would pop in there and just dominate a race—like at the opener in Gainesville. But Reynard always seemed to be coming back from injury, winning, and then getting hurt again. No one could maintain consistency in the class, and soon Lamson had returned to the tour and started lighting it up. Coming from over 60 points down, he kept chopping away at the points lead until the Steel City finale, when he and Hughes squared off for the championship. Hughes won moto one, but Lamson struck back to lead moto two. Hughes started pushing the pace to catch up, but couldn’t close the gap. Lamson won the moto to seal the title, while Hughes’ chain snapped on the last lap. In a memorable scene, Ryno pushed his KX125 across the finish, defeated, but never giving up. It was moments that this that made Hughes an American motocross folk hero. At the Motocross des Nations in Sverepec, Slovakia, Team USA entered the event in an unfamiliar position—without a win streak. The team of Lamson (125), Emig (250) and Hughes (on the same KX500 that LaRocco and Kiedrowski had been riding) gave it a run, but ultimately came up just short to the Belgian team of Marnicq Bervoets, Stefan Everts and Joel Smets. New stars were born during the 1995 season, and one old one returned—Bradshaw! 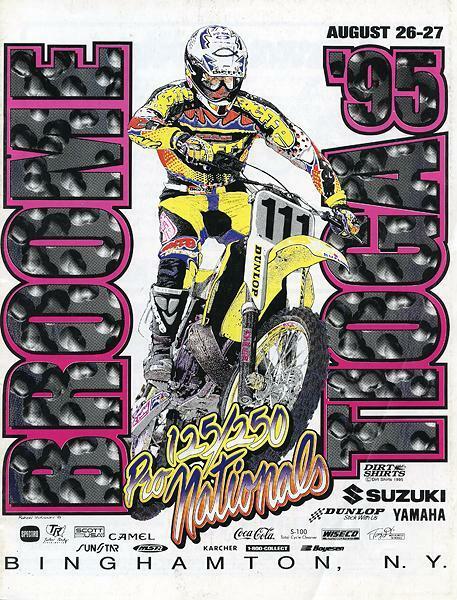 After sitting out the 1994 season with burn out, Bradshaw came out of retirement at his favorite track, High Point, running number 114. His results were mixed, at best, and he was never a threat to win races. But he was just getting back into it—could he perhaps challenge McGrath and Emig the next year? In contrast to Bradshaw’s return, Kiedrowski finished third in the 250 standings and won two nationals. Then he announced his retirement! Clearly, a new generation had arrived. But we will tell you all about that tomorrow when we take a look back at 1996. Somewhere in this classic Dirt Shirts design you will find Greg Albertyn, three-time world champ but AMA rookie in 1995.